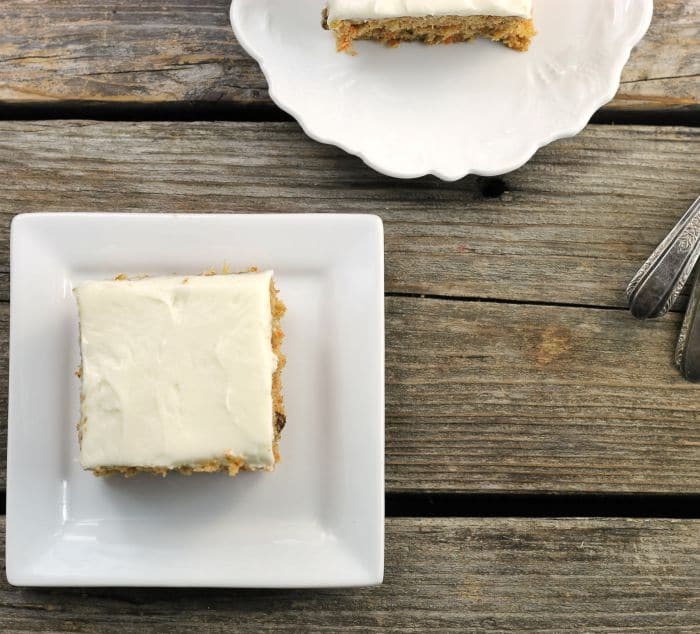 These carrot zucchini bars with cream cheese frosting are simple to make and it something that whole family will love. We grow zucchini in our garden, so at this time of year, I am always looking for new recipes to use it up. I hate to see it go to waste, but it really is too hard to keep up with the stuff. If you grow zucchini you know what I am talking about. One of my favorite ways to use up the zucchini from the garden is to make zucchini bread. Usually, I will make a few loaves at a time so that I can give some away. I made this pan of carrot zucchini bars so that I could bring it to my mom’s house last Sunday. I have mentioned on my blog before that my mom’s house is a gathering place on Sunday night’s for my family. There is usually one of my siblings there and my daughter and grandchildren like to stop by also. Just to let you know that they were a hit. I got a lot of compliments on the bars. Hope you make these bars and get compliments on them, too. What is the best way to grate zucchini? I find that a box grater works the best for zucchini. You will want to wash the zucchini first and cut the ends off. Put the box grater on a cutting board or a jelly roll pan works well. Run the zucchini over the large holes to grate it. What is the best way to grate carrots? I find that a mini food processor works well for this. It takes a little time and you can have a bunch of carrots shredded. 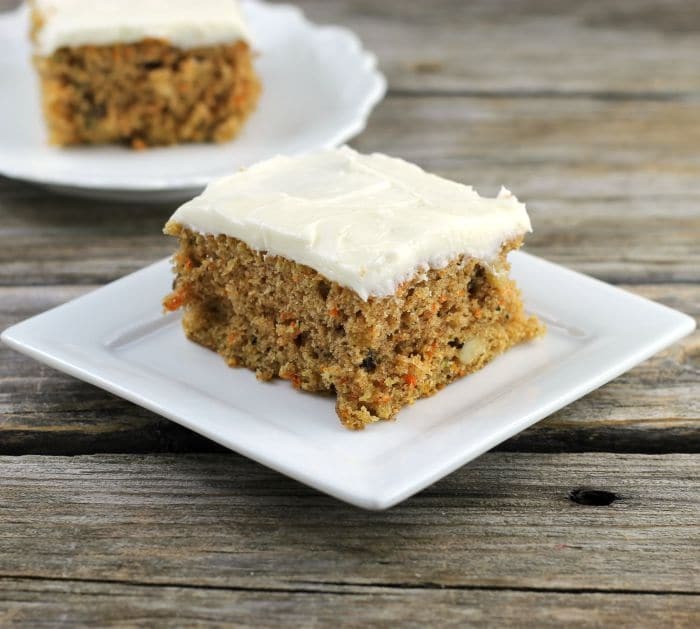 Cut the carrots into small pieces or use baby carrots and work in batches. In a large bowl beat the sugar and oil together with an electric mixer. Add the eggs in and beat in. Add the shredded carrots and zucchini and mix in. Sift together the flour, baking soda, baking powder, salt, and cinnamon. Add to the wet ingredients and mix in until well blended. Add the chopped walnuts and fold in. Pour the batter into the prepared baking pan. Bake for 28 to 30 minutes. Remove from the oven and cool completely before frosting. For the frosting - In a medium bowl beat the cream cheese with an electric mixer until fluffy. Add the butter and mix in. Add the vanilla and milk and beat in. Add the powdered sugar and mix until creamy. YUMMY! 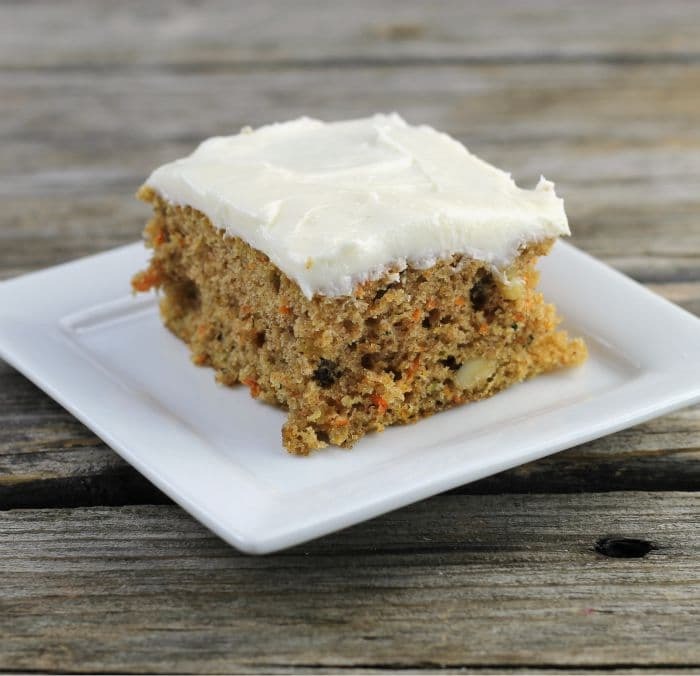 I like that you have used two of my favourite veggies in this summer cake! 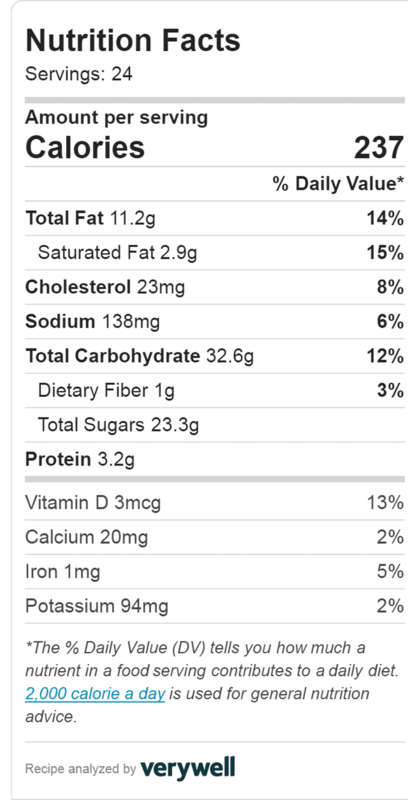 Yes – zucchini is crazy right now! I love that you used it in these bars and with carrot too! Such great flavors! They look so delicious! Wow! 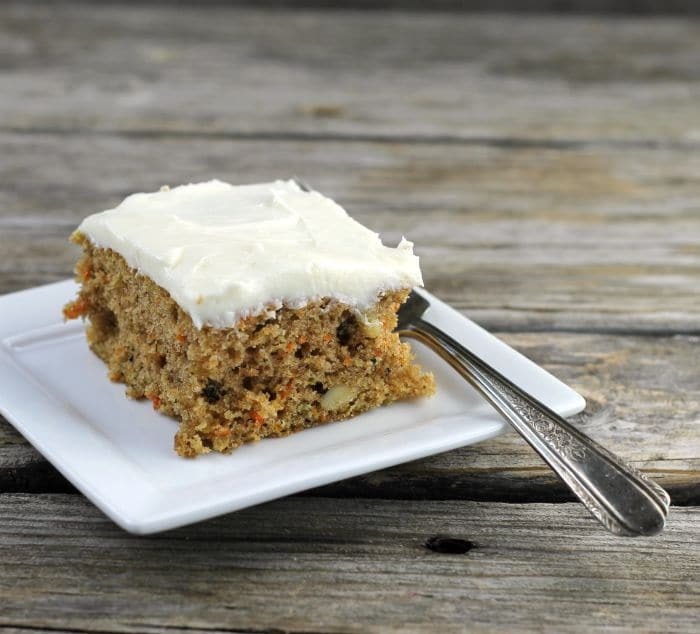 It’s been so long since I’ve had a zucchini cake with a cream cheese frosting, that I’d forgotten that they exist! Your post brought back so many memories for me. Thanks for the recipe! 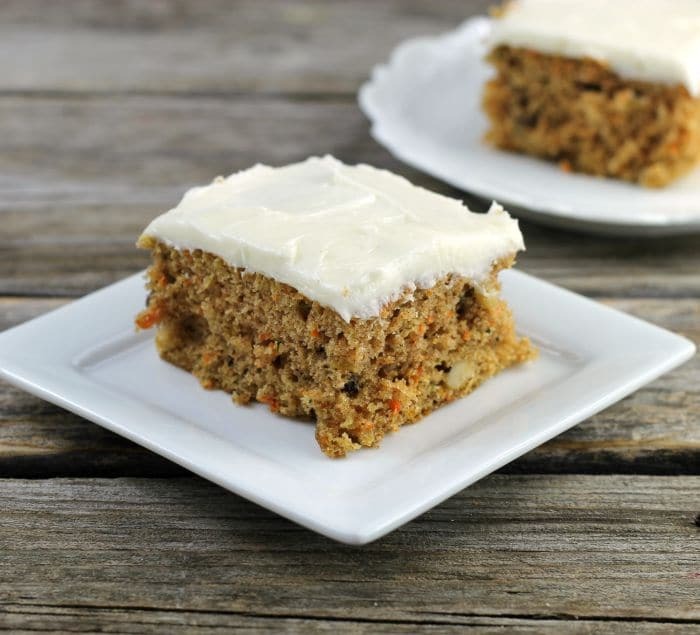 I love carrot cake, and I love zucchini bread…and this recipes sounds like the perfect intersection between the two! I would be all about these for a fun summer dessert!